We have passed the halfway point of the legislative session. We have reached both the policy and fiscal committee cutoff, meaning House bills that have not passed out of their respective House committees are “dead” and will not advance. There are a few exceptions to the cutoffs for budget-related legislation. House Bill 2313 would raise the smoking age to 21. I am a co-sponsor of the bill. This bill may protect our youth more than any other policy bill we consider this session. National data show that 95 percent of adult smokers begin smoking before they turn 21. The ages of 18 to 21 are also a critical period when many smokers move from experimental smoking to regular, daily use. If this measure passes, it will save our state money in the long run as we will be spending less in the health care system due to fewer people smoking. House Bill 2969 would regulate the vaping industry including looking at taxes. Currently vaping has fewer rules and regulations around it, especially when you compare to what Washington state does to regulate and enforce smoking and tobacco. Both bills are still being negotiated, but I am hopeful we will reach agreement on the details before we adjourn on March 10.
repeated concerns about Washington State Ferries. The governor was quick to call this a political stunt, but many citizens in our state would like to see new leadership at DOT. You can read House Minority Leader Dan Kristiansen's response to the governor's comments here. Since then, Department of Corrections Secretary Dan Pacholke has announced his resignation. The department released more than 3,200 prisoners early due to a computer glitch resulting in the deaths of two innocent people. Apparently, they have known about this for a number of years. Our state agencies need leaders that will provide some accountability and transparency. Recently, the House honored the 8,000 men and women of the Washington National Guard through House Resolution 4652. This is always a special day for our caucus. We have more veterans than any of the other three caucuses, and we also have many spouses, children and parents of military members. Rep. Brad Klippert gave a floor speech about a fallen hero, Staff Sgt. Matthew McClintock, who was killed in Afghanistan on January 5. You can learn more about Mr. McClintock's life and legacy in this article. 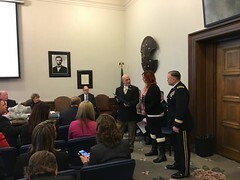 Mr. McClintock's widow, Alexandra, and Maj. Gen. Bret Daugherty, commander of the Washington National Guard, joined us in our caucus room following the House ceremony. We are very fortunate to have many special people come through our doors and visit us in caucus. This week, Seattle Seahawk wide receiver Jermaine Kearse was in Olympia and spent some time with our caucus. He wasn't talking football – he discussed his foundation that supports and inspires youth in military families, including kids who have lost parents in service. It can be difficult for kids of military families to get to participate in what most kids would view as normal education and learning experiences, sports or outdoor camps and other opportunities. It could be because of their military upbringing or they may have lost a loved one while serving in the military. Listening to Mr. McClintock's widow and Jermaine Kearse reminds us how important it is to honor and remember our military, as well as their families. They all make sacrifices so we are able to have the freedoms we have living in this great state and country.